Cierra Hooks stood at the top of the 3-point line and dribbled. Her teammates stood spread out on the perimeter, and the lane was clear. As the clock ticked with under a minute left in Mackey Arena, Ohio needed a bucket to put Purdue away. And with the ball in the hands of Hooks, Ohio’s quickest player, a basket at the rim was likely. With under 50 seconds left, Hooks raced to the hoop and made a layup. The Bobcats went up by five and maintained the lead from there. They defeated the Boilermakers 77-71 on Sunday, earning their first win against the Boilermakers since Feb. 6, 1982. The good shooting game the Bobcats needed finally came, and on top of that, they continued to play aggressive on defense. Before the game, the Bobcats were known for their strong perimeter defense. Ohio has the top turnover margin in the country, and it forced Purdue to commit a season-high 33 turnovers. “Our ability to turn them over was probably the difference in the game,” coach Bob Boldon said. The Bobcats needed to continue playing stifling perimeter defense, especially considering the Boilermakers were the best 3-point shooting team in the Big Ten before the game. More importantly, though, the Bobcats needed to show an ability to shoot better. The Bobcats shot 34.8 percent from the field and 23.0 percent from three before Sunday. But as they hoisted shots in Mackey Arena, the shots finally fell. The Bobcats shot a season-high 62.5 percent from three and 46.4 percent from the field. Before Friday’s practice, Boldon said that the Bobcats had dipped recently on the defensive end. But the Bobcats were also spending more time in practice on their offense — the productivity on defense would naturally dip. Still, the Bobcats played one of their best games on the defensive end against the Boilermakers. They kept with the Boilermakers’ speedy pace, scoring 36 points off turnovers. This game has a chance to be a turning point for the Bobcats. It’s their best game of the season to date. 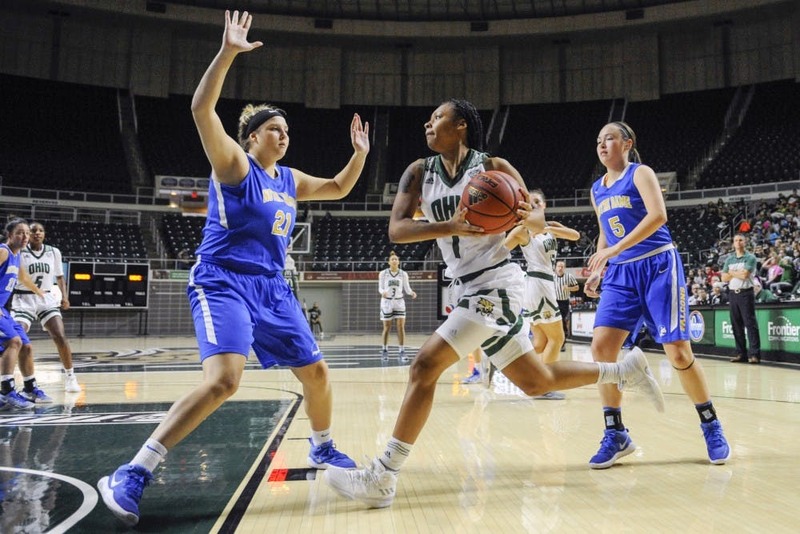 Because if the shots continue to fall at a reasonable rate, and if they continue to play some of the best defense in the country, the Bobcats have a chance to be one of the best teams in the Mid-American Conference. UP NEXT: Ohio will travel to West Palm Beach, Florida, where it will play Furman and Virginia in the West Palm Beach Invitational.